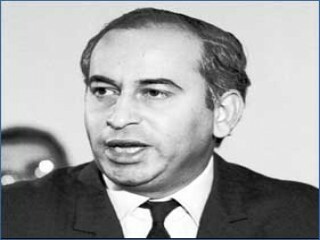 Zulfikar Ali Bhutto (January 5, 1928 - April 4, 1970) was a Pakistani politician who served as President, from 1971 to 1973, and as Prime Minister, from 1973 to 1977, of Pakistan. He has the rare distinction of being a civilian Chief Martial Law Administrator. Bhuttl was born in Larkana (in what is now Pakistan) the only son of Sir Shah Nawaz Bhutto. He completed his early education in Bombay. After completing his initial education, he went to the United States in 1947 to study at the University of Southern California and later transferred to the University of California, Berkeley. He applied to Harvard and accepted but chose to stay at Berkley. While at Berkeley he was the first Asian student to be elected to the Berkeley Student Council. From Berkeley he earned a degree in political science, after which he went to Oxford and studied at Christ Church College from where he graduated with honours. Following his time at Oxford, he was called to the bar at Lincoln’s Inn in 1953 (which had also been attended by allama Iqbal and Muhammed ali Jinnah). The same year, his first child was born, a daughter Benazir, who would later become prime minister herself. In 1958 he joined the cabined of Iskander Mirza. From there, he was active in the Pakistani government working at various posts. In 1966 he resigned from the cabinet, after serving as Foreign Minister. In 1967 Bhutto formed the Pakistan People’s Party (PPP) to oppose Ayub Khan’s regime. He was arrested in November 1968 and detained for three months. The movement he helped unleash in West Pakistan in conjunction with agitation for greater autonomy taking place in East Pakistan (now Bangladesh), forced the resignation of Ayub Khan in March 1969. Ayub Khan handed power over to the army commander in chief, Agha Muhammad Yahya Khan, who assumed the presidency and reimposed martial law. The issue of an autonomous East Pakistan continued to plague Yahya’s administration. In elections held in 1970, the pro-autonomy Awami League won by a landslide in East Pakistan, capturing enough parliamentary seats to control any government that might be formed. Bhutto’s PPP captured the majority of seats in West Pakistan. When Yahya and the PPP delayed the transfer of power to the mewly elected representatives in March 1971, public unrest erupted in East Pakistan. East Pakistani leaders demanded the establishment of an independent nation of Bangladesh, and the Pakistani army cracked down brutally on civilians as well as on armed revolutionaries in East Pakistan. When India intervened in the civil war in December, the Pakistani army was swiftly defeated, and East pakistan emerged as the state of Bangladesh. Yahya Khan resigned, and Bhutto was inaugurated as president and chief martial law administrator on December 20, 1971. Bhutto introduced socialist economic reforms while working to prevent any further division of the country. He nationalized Pakistan’s mijor industries, life insurance companies, and private schools and colleges. Bhuto enacted tax relief for the country’s coorest agricultural workers and placed ceilings on land ownership. He countered secessionist movements in all of Pakistan’s provinces, lifted martial law in 1972, and pushed through a new constitution in 1973 that recognized Islam as the national religion. Under the parliamentary system established by the new constitution, Bhutto became prime minister. During elections held in March 1977, nine opposition parties, united as the Pakistan National Alliance (PNA), ran a popular campaign against Bhutto’s PPP. When the PPP won a decisive victory in the parliamentary round of the elections, the PNA accused Bhutto’s party of rigging the vote and withdrew in protest from upcoming provincial elections. Widespread street fighting broke out, and opposition politicians were arrested. On July 5 the military, led by General Muhammad Zia ul-Haq, staged a coup. Zia relieved Bhutto of power, holding him in detention for a month. Upon his release, Bhutto travelled the country amid adulatory crowds of PPP supporters. In September the army arrested Bhutto again on charges of authorizing the murder of a political opponent in 1974. Bhutto insisted that the allegations were false, but the high court in Lahore, packed with Zia’s supporters, convicted Bhutto and imposed the death sentence. The Supreme Court approved the judgment by a 4-3 vote, and despite international protests, Bhutto was hanged in April 1979. He is buried in his ancestral village of Larkana next to his father.